Simplicity and understatement. Two very powerful tools that are employed too infrequently. Whether you’re telling a story or mixing up a batch of ejuice, if you can keep it simple and understated you’re half way to a masterpiece. Velocity starts with a sweet yet mild strawberry flavor with hints of sweet rich cream. On the exhale there’s also a subtle note of that graham cracker crust. The vapor is creamy and the throat hit is mild. The aroma of velocity is understated, yet unmistakably that of fresh strawberries. 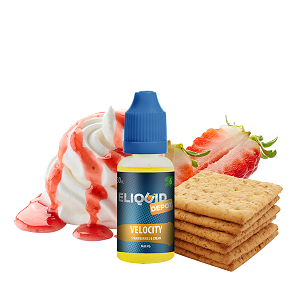 The experience of vaping Velocity, from a flavor standpoint anyway, is very much like a slice of strawberry pie slathered in whipped cream with a thin graham cracker crust. I’ve been vaping Velocity for about three days and it’s been quite enjoyable. It’s especially good with a cup of hot coffee. If you enjoy simple tastes, blended expertly, then you’re going to enjoy Velocity. And if you’re a strawberry ejuice fan you’ll find Velocity quite satisfying. This understated blend will keep you coming back for more. Eliquid Depot offers Velocity in 30 ml and 120 ml bottles for $7.99 and $19.99. 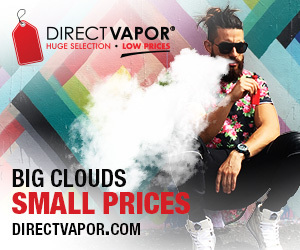 Available nicotine levels are 0 MG, 3 MG and 6 MG. Eliquid Depot mixes Velocity and all of their ejuice in a 20/80 PG/VG ratio for ideal performance in sub ohm tanks. I vaped Velocity in an Eleaf MELO 2 tank on the iStick TC60W mod. 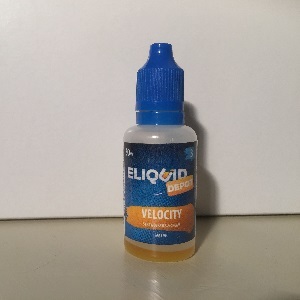 Eliquid Depot supplied the bottle of Velocity I sampled for the purpose of this review. Order Velocity from Eliquid Depot.